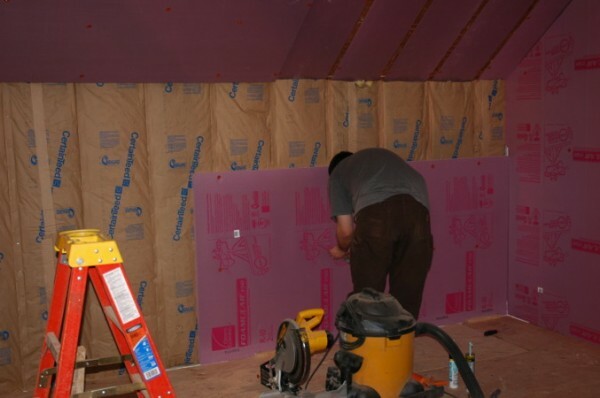 Our last post about our progress in super insulating the master bedroom left us with the first layer of R13 fiberglass insulation and the end wall sheathed in OSB as a structural upgrade. 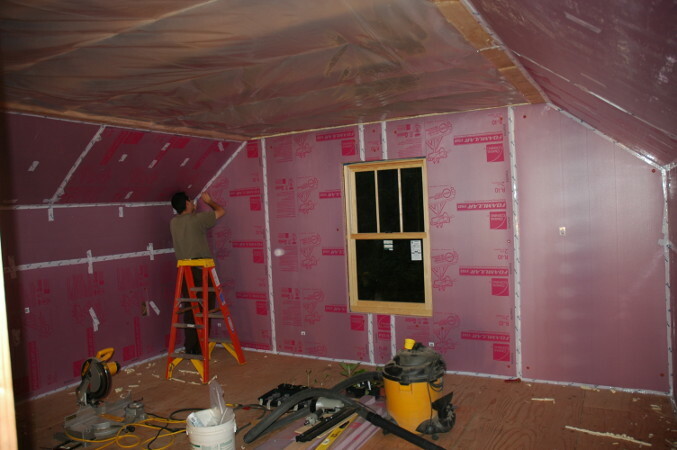 Next up is the middle layer of insulation. This is comprised of pink XPS foam board which serves three roles. It increases the insulative value of the wall by an additional R10, it provides a thermal break between the outer walls and inner walls (since wood is a poor insulator, a lot of heat is lost through the studs that hold up typical walls), and it acts as an air barrier (when sealed properly). 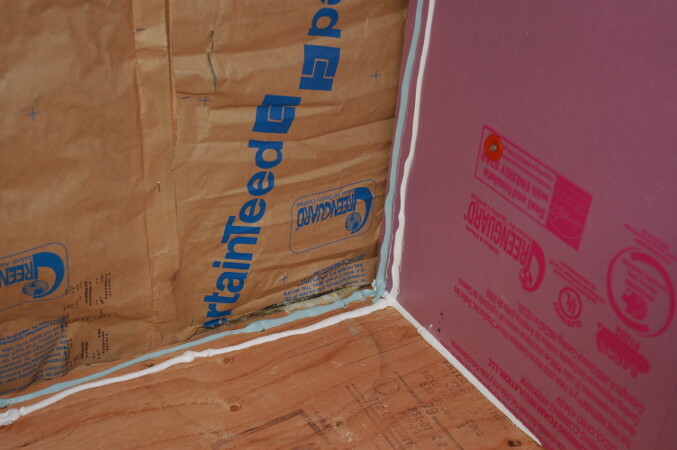 Most heat loss in modern homes is through unwanted air transfer via small holes in the construction. 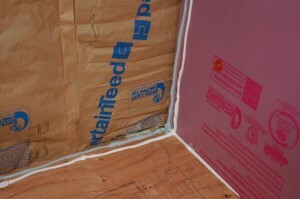 On the end wall, we attached the foam board directly over top of the OSB sheathing. 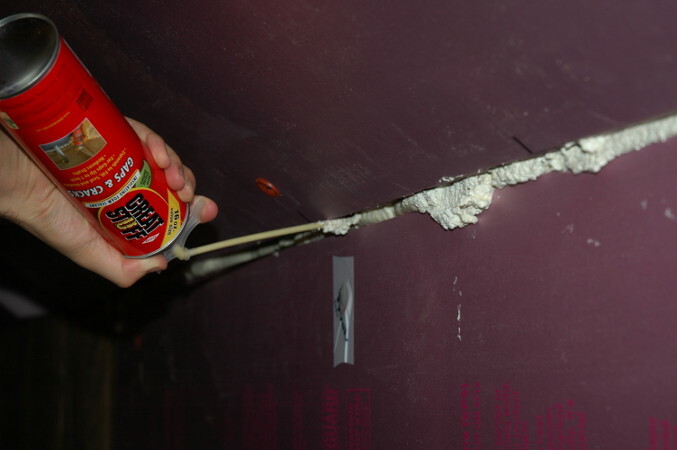 To join foam panels, we applied two beads with a caulk gun: one bead of PL300 foam adhesive, and one bead of siliconized latex caulk. On the knee walls, we nailed the panels up to the studs. We used the same 3″ cap nails that we’ve grown to hate from previous steps (because they bend so easily). The junction between the angled and knee wall panels would be difficult to seal with caulk, so we used spray foam. Spray foam was also used to seal other large gaps and potential leak areas. It will eventually be used in the attic to seal the top plates of the inner walls to the foam layers. We trimmed back excess foam after it had dried so it would not interfere with later steps. As a final insurance against air leaks, we taped the connections between the panels, floor, and ceiling using Tyvek tape (which is designed to bond to plastic/foam surfaces). The cap nail locations were also taped. This is really sticky tape, and should provide good insurance against cracks in the caulk which will form as temperature changes cause the foam panels to change dimension. That is going to be a well-sealed room. One question, what about fresh air exchange? That is something I think about in our old house. We currently have PLENTY of fresh air exchange routes (aka drafts), but as we seal things up, how do we ensure good air exchange without a system…. Good work, though. It will feel great in the winter. Our bedroom is in the low 50s in January and February! Wow! You are going to stay warm in the winter in there. Very impressive! That room will be tight! Ali does bring up a good point though. We did similar in insulating and sealing our house. In our case, for fresh air exchange in winter, we get the wood stove roaring and open the windows for a while. It’s actually quite nice that way… radiant heat and fresh air at the same time. I worried a lot about the air quality, but doing good sealing like you guys are doing will go far in preventing condensation within your walls, leading to mold. Back in MN, where we used to live, building code actually requires an air exchanger for new construction. Those are pretty nifty, and I planned on using one here initially, but balked at the cost and determined we really didn’t need one after living here in winter. I also caulked all outlet boxes, all around the wires and unused holes, and between drywall and outlet box. Glued perimeter of drywall to the studs too. We didn’t use a vapor barrier, being in a mixed humid climate. It all makes a big difference! It’s really coming along. Next winter should be much cozier for you than the last! Sweet! A pink princess room! Hey everyone, thanks for the comments. It’s a lot of work, but we’re definitely looking forward to staying warm when this is all done. The process isn’t all that complicated so far, just detail oriented. I expect future rooms will go faster. With respects to Ali and Woody’s concerns about air exchange, these are certainly valid. The energy shortage of the 70s led to some knee-jerk building standard changes and fear of the infamous “sick building” syndrome that resulted seems to have been permanently written into our social consciousness. The reality is that some sort of system is needed, but I think a good case can be made for the economics. It’s certainly accepted that we need our homes to exchange a certain amount of air to stay healthy. Air exchange is typically measured in ACH [Air Changes per Hour]. 1 ACH means that a volume of air equivalent to the volume of the house is moved through the house in one hour. Homes built in the last 20 years generally have 1-2 ACH of leakage. Older homes generally have 4-5 ACH of leakage (this is where window curtains start moving when the wind blows). As a point of reference, modern net-zero homes can achieve 0.02 ACH. Since air loss can account for up to 2/3rds of heat loss from a building, we obviously want to reduce this number as much as possible without sacrificing indoor air quality. Current accepted ASHRAE 62-1999 standards call for a minimum of .35 ACH of ventilation to ensure a healthy building. Now, ideally we could build a structure that would just happen to leak passively at about .35 ACH so no active system was needed, but this is basically impossible. Buildings lose more air as the temperature difference between the outdoors and indoors changes, because the hot air stacks up at ceiling of the second floor and pushes harder to get out. Similarly, buildings lose more air when it’s windy because of the pressure differences on the walls. So, if it’s cold and gailing, your house will have a very high ACH and if it’s temperate and mild it will have a low ACH … that’s pretty much exactly what you don’t want. And of course, all that air leaking out through the walls is the primary cause of moisture drive, leading to a whole host of other building problems. The solution, is to build a structure that is very tight, and then operate a small mechanical system which will provide the correct amount of ventilation. Systems range from very simple to very complicated. The simplest is just a bathroom fan with a low setting that runs continuously and in inlet vent somewhere on the other side of the house. The most complicated, is the HRV [Heat Recovery Ventilator] that I believe Ron is describing. This is a box which runs two fans connected to ducts which have intakes and outlets spread about the house. The streams of fresh outside air and stale interior air pass each other in a heat exchanger which preheats the outside air with the latent heat in the waste air. This is a really cool machine, and one of the core technologies on which the ultra-efficient German Passivhaus standards are built. The geek in me would love to install an HRV, but the engineer in me ran the numbers for heating costs, operating costs and equipment costs, and I believe that for our climate a simple two fan approach with no exchange is more economically appropriate. Having two fans allows you to balance the system, so the house doesn’t have a slight negative pressure that might cause the woodstove to backdraft when the door was open. When we get the house completely sealed up, I’m going to have it blower door tested so I know just how leaky it really is. This will tell me the passive ventilation rate, and the fan rates can then be set to make up the additional air requirements. In the event of a power failure, we can still get ventilation (albeit less controlled) by opening a window slightly on the first and second floors. Ron’s method of a blazing wood stove and a single open window usually works too, but our woodstove will have a separately ducted outside air intake and can’t be used in that manner. Yeah, I was describing an HRV. Way up north, the economics make sense, since heat is conserved. Down here, and when heating with wood, conserving every last drop of heated air is just not a big issue. Thermal mass makes a bigger difference, I think, than allowing small amount of heated air to escape. I did not run separate air to our woodstove, so we generally have a cracked window somewhere. The modern air-tight woodstoves don’t send a big whoosh of air going up the chimney, so I found the actual rate of air coming in and going out to be quite measured. I can’t think of anything better than soaking in radiant heat in the winter, a mere twig boosting the indoor temps to balmy!